Are you a print shop? My cousin/aunt/bridesmaid "designed" some wedding items for me, can you just print them on your paper? Can I send you an invitation design I created and have you print/cut them for us? I made myself a monogram, could you use it on the designs you'll make for us? How wonderful that you've already tackled the design of your wedding paper! However, our business revolves around our custom designs and process. It's what we're known for best. At this time, we do not accept out-of-house files or artwork. We reserve our production spots exclusively for clients who book us for full custom design services. What you're looking for is a print and copy shop --> Some of the best local options are MinuteMan Press, PIP Printing, and Office Depot. They tend to have great turnaround times and pricing. Do you envision a modern, luxurious statement piece for your wedding invitation? Do you have a flexible budget allotted for wedding stationery? 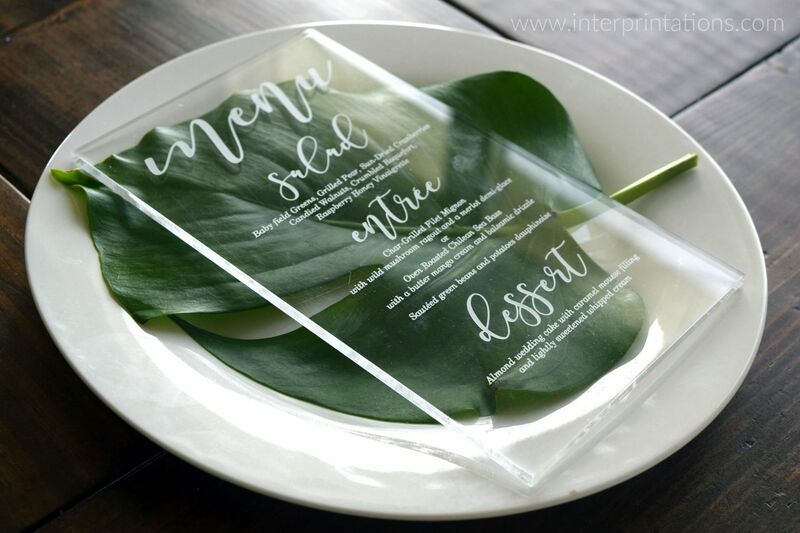 If the answers are "yes", we recommend creating a clear acrylic wedding invitation! A total wow factor, right? We laser engraved the clear acrylic, leaving it with text in white. We then laser cut it into a traditional A7 rectangular size. Though the beauty in laser cutting is that the shapes and sizes for custom invitations are endless. Simply let us know your wedding invitation vision, and we'll work with you on a digital mockup + a prototype for review during the final stages. Another lovely aspect of a clear wedding invitation is the simplistic beauty of it. 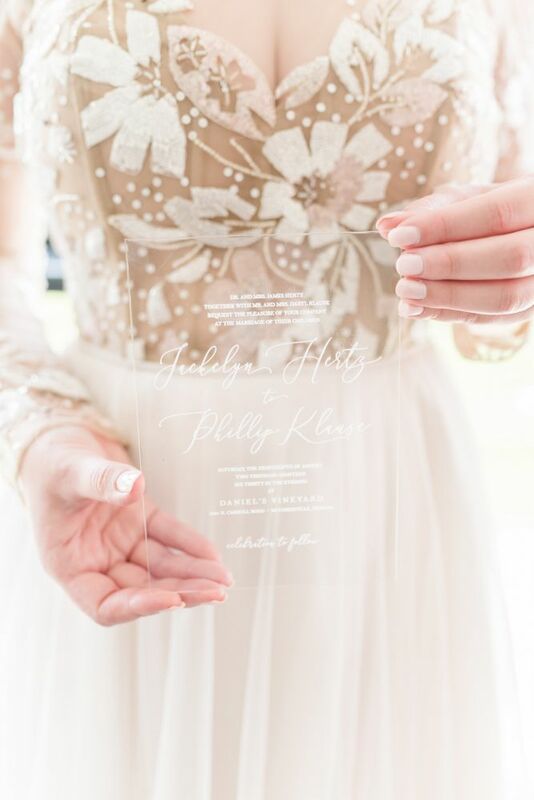 We'll let the layout and pretty fonts take center stage, with the lovely clear acrylic acting as an elegant backdrop. Are you an Indianapolis bride planning a 2018 or 2019 wedding? Are you looking for a semi-custom stationery line that is also easy on your budget? We have just the thing for you - our online wedding stationery collection. Just click the "SHOP" link above to check out all of the pretty pre-designed goods and GREAT deals! We've taken some of our best sellers and favorite designs, and curated them into an easy-to-order collection. Our online stationery shop offers a variety of styles, papers, and upgrade options. Are you looking for flat panel invitations? Laser cut invitations? Ceremony Programs? Or perhaps some pretty table number cards to dress up your reception tables. We have it all, and more in our shop. Even if you're not located in the Indianapolis area, we offer affordable shipping & a seamless digital proofing process. If you have any questions, feel free to email us at hello@interprintations.com. We'd love to hear from you! I’m a country girl, small business owner, wife, mother of three, and a proud alumna of Purdue University (Boiler Up!). Wondering what life is like for a busy mom with a graphic design & laser cutting business? My days are filled with pretty paper, blissful brides, half-finished sketchbooks, half-eaten lunches, and lots of cuddling with my little ones. I look forward to sharing with you all of life's fun happenings (both in & out of the studio) here on the blog!